Jim Julia sells millions of dollars of antiques yearly at his auction house in Fairfield, Maine, but never before has he sold a single object for over one million dollars — until February 5, 2010. On that day, Jim sold a very rare and historically important map — George Washington’s personal copy of the Battle of Yorktown. In 1781, General Comte de Rochambeau and his French army combined with George Washington and his American army to defeat General Lord Cornwallis and his British army at the Battle of Yorktown in Virginia. This was the last major battle of the American Revolutionary War. 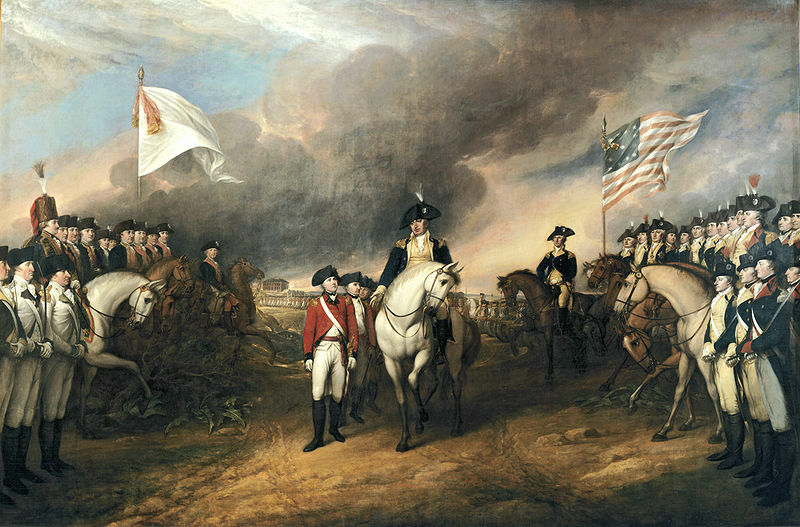 Cornwallis’s surrender led the British to ultimately negotiate an end to the war and sign the Treaty of Paris in 1783. The map was prepared by Jean Baptiste Gouvion a few days after the battle. It descended in the family of Tobias Lear, the personal secretary to George Washington from 1784 until Washington’s death in 1799. The action in the auction was furious with many bidders on the telephone and one determined bidder in the room. Ultimately the phone bidder won the battle against the bidder in the room, with a winning bid of $1 million, for a total of $1,150,000, including buyer’s premium. 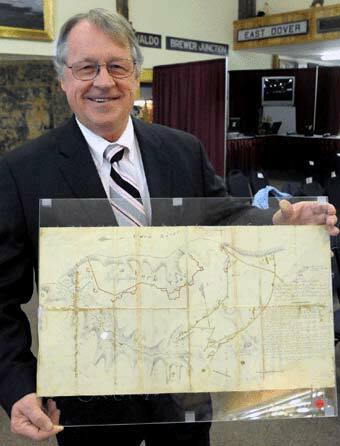 It set the record for the most expensive map ever sold at auction and also the highest price every paid for any object at auction in the state of Maine. 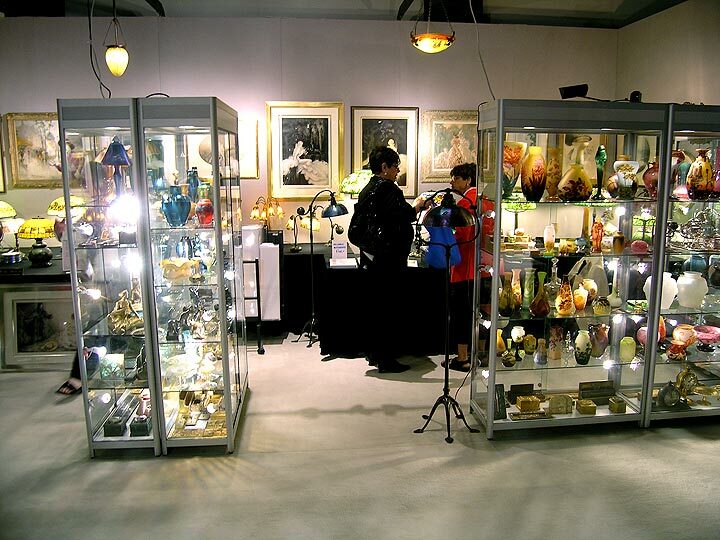 Friday: The antiques portion of the show opened at 3 PM and lasted until 6 PM. 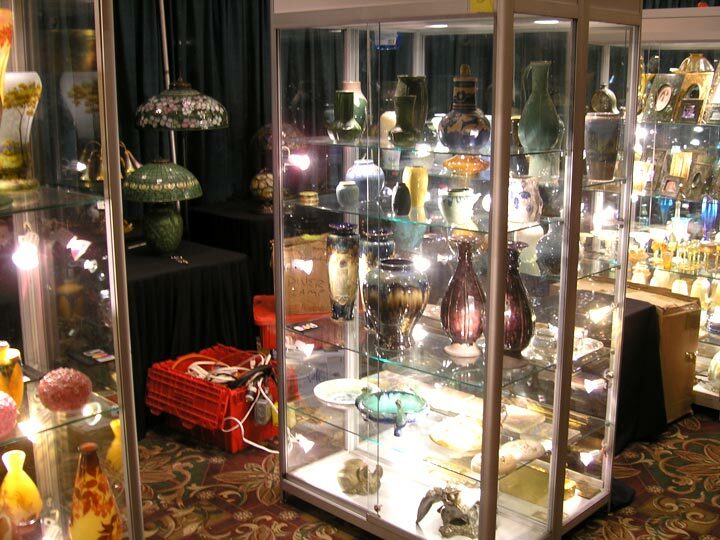 The main ballroom is small and holds about 50 antiques dealers. The crowd was large for this small room, so it was packed and busy. Lots of folks thanked us for exhibiting at the show and raising the level of quality at the show — that’s very nice to hear! Not many sales, but the show is off to a good start. Saturday: Hours today are 12 – 6 PM — short by most show standards. A good crowd showed up, but not the exceptional crowd that I was led to believe would be here. One dealer told me that the show used to be only Saturday and Sunday and it was his theory that Saturday was slower than normal because the show was open for 3 hours on Friday. I’ve always liked 2-day shows like the Pier Show in NYC, because of the intensity and excitement. I would like to see this show revert back to that format. Again sales were few, but good ones, so the day was a success. Interest was strong in anything Tiffany Studios. 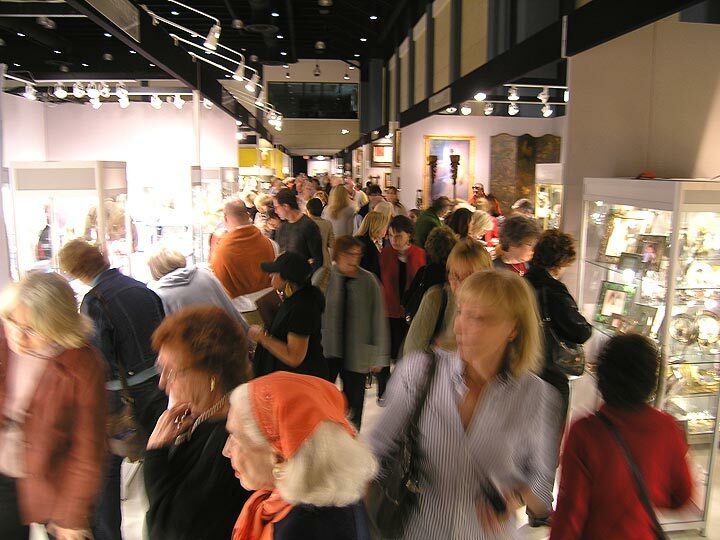 I assumed that there would be more interest in the pottery I displayed, but I was wrong. There was so much pottery at this show that my offerings were diluted by the plethora of offerings. 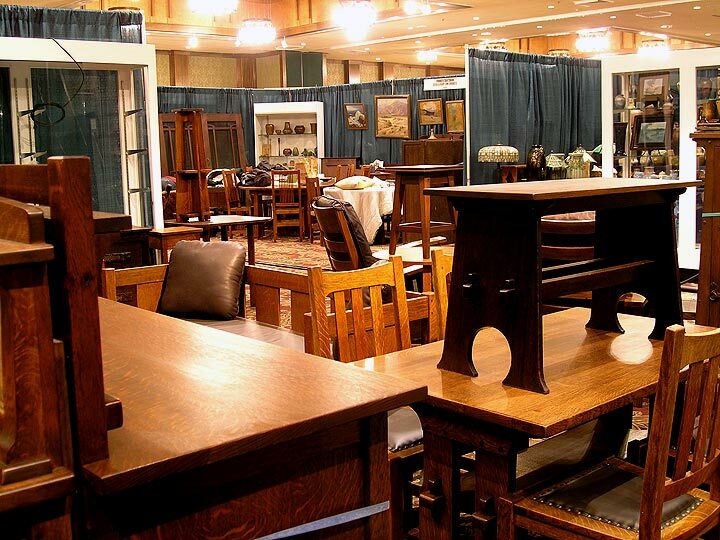 In looking around the show, sales of Arts & Crafts furniture were quite good, with many items having sold tags on them. Sunday: Nice short hours from 11 AM – 4 PM — can’t beat that. That’s more than enough time for people to make up their minds and short enough for dealers to get out early on Sunday and start their trips home. I made a bet with Lia that we wouldn’t sell a thing on Sunday, and I’m happy to report that I lost. One nice sale and one small sale. So the final tally was a good show for me. Business is certainly back. Every show so far in 2010 has been a good one. In speaking to other dealers at this show, almost everyone remarked that it was a big improvement from last year. 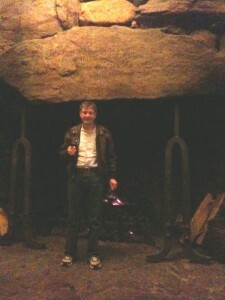 One furniture dealer told me it was his best show ever, at this show or any show! I’d love to exhibit here next year, but I think there’s going to be a date conflict with another show, so I may have to skip it. Too bad! It’s very pleasant here — the folks, the atmosphere, the promoter, the other dealers. It’s Tuesday, 5 PM, and the show is winding down. It’s hard work sitting for so many hours, talking to hundreds of people, but it’s gratifying when the show goes well, and this one went well. I personally talked to about a dozen exhibitors and most were very pleased with the results. One painting dealer (there were many painting dealers at this show) told me he did poorly. One general dealer told me he would have made a profit, had his expenses not been so high. Another dealer in English furniture and objects told me he had a good show. A Steuben dealer had a very good final day for a very good show overall. For the most part, most dealers did well. Attendance was truly outstanding throughout the show, especially on the weekend. Today, Tuesday, was the lowest attendance, but even that was pretty good. The problem was that all the real buyers already were here, so today’s crowd was out for a good time only. If the show had ended yesterday, it would basically have been the same. The show promoter did an excellent job. There were banners everywhere around town announcing the show, including a beautiful full-size outdoor billboard. If you lived anywhere in this area, it would have been impossible not to know about the show. Too bad most other show promoters do not put the same effort and resources into promotion. Interest was strong in everything Tiffany, including lamps, desk sets and glass. Sales in Icart etchings and oil paintings were strong, a welcome change from the recent tepid interest. Surprisingly, interest in French glass was good, but sales were not. It appears after several strong shows in Florida that the market has come back in a meaningful way. Besides personal experience, I’ve seen lots of anecdotal evidence. It appears that the economy is recovering nicely and that the statistics will soon reflect the increased optimism I see. I’m writing this blog from the show at 6:45 PM on Saturday. The show formally opened to the public today at 11 AM, with a preview party yesterday evening. Preview party: Very well attended with most people in a very good mood, but I have a major gripe with all preview parties. I wish they didn’t exist. They may be great fun for the attendees, but they’re torture for the exhibitors. Most people go to have a good time, to see and be seen. I’m there to do business and that seems to be in conflict with the goals of the guests. Result: one sale to another dealer who I know, none to the general public. Saturday: Attendance was unbelievable today. I haven’t seen so many people attend an antique show in 20 years. The problem is that most of the people were here because they had free tickets to attend. The show promoter is very generous in distributing tickets, so why not attend? The problem from the dealer standpoint is that most of the people were here for a good time and again that’s in direct conflict with my interests. Based on the number of inquiries, I should have sold half my booth, but sales lagged far behind interest. Many people took business cards and many people said they’ll return, so we’ll see. Result: a few sales to the general public. Sunday 4:35 PM: Gotta hand it to the promoter. Attendance again was outstanding — lots of questions and interest. I usually prefer it when there aren’t so many free tickets because paying an admission price separates the lookers from the buyers. On the other hand, you can’t make a sale to someone who isn’t there, so good attendance is important. Result: sales much better. This continues a trend that I noticed at the Miami Beach Antiques Show — sales got better on the second day of the show — very curious. Historically sales have been best on opening day, but I don’t look a gift horse in the mouth. If the second day is better, so be it. I’ll post a blog on Wednesday morning with the final results. The show continues until 6 PM on Tuesday. I’m writing this post from the passenger seat of a rented car on I-85, north of Charlotte, NC. Now for the story of how we got here. Our scheduled departure for West Palm Beach, FL was today. 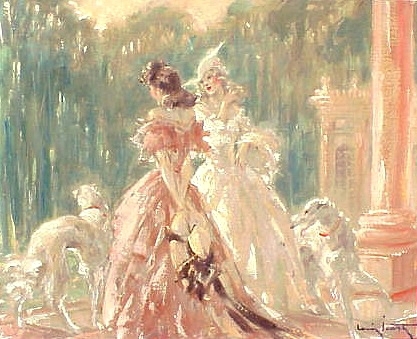 The Palm Beach Jewelry, Art & Antique Show	begins setting up tomorrow, with the opening preview party on Friday night. You probably know that a massive winter storm is presently battering the Northeast of the US. Since we had plenty of notice, I personally went to the airport on Monday to change our tickets to leave yesterday, Tuesday. The US Airways agent was very helpful and changed the tickets in five minutes. There was no penalty because all the airlines were permitting changes because of the impending weather. We were scheduled to fly from LaGuardia Airport in NYC to Washington, DC at 3 PM on Tuesday. I asked the agent if he could give us a more southern connecting city, but he said all the seats were sold. I was justifiably concerned about possible weather conditions in DC. We arrived at LaGuardia on Tuesday at 1:45 PM, with plenty of time to spare. We started to check in, when the agent said he couldn’t find our reservation. Huh?? I had a printout of our flights from the previous day’s agent. When the agent in front of me continued checking, he found out that our flight from Washington, DC to West Palm Beach, FL, had been canceled and rescheduled for the 13th, four days later. Can you believe it? US Airways never informed us by phone or email that our flight had been canceled and rescheduled. I explained to the agent that we HAD to get to Florida in time to set up a show. Our driver was already halfway there with our merchandise and we had paid in full to exhibit there. For an hour and a half, Thomas valiantly tried to find an alternate route to ANY city in Florida on ANY airline, but every seat was sold out on every flight out of the area. My backup plan was to take a 24 hour train to Florida, but when I called Amtrak, I was told that all southbound trains had been canceled. I suggested to my wife that we go home and get our car and drive to Florida, a suggestion that I really didn’t want to follow, but what was the alternative? My wife suggested that we rent a car one way to a southern city and then fly the rest of the way. Luckily I was able to find a car rental agency with a car left that we could take. We took the shuttle bus to the rental counter and were delayed there still more. We didn’t start driving until 5 PM. The big problem was that all the weather predictions were telling us that we only had a few hours until the storm was upon us. The prospect of driving in blizzard conditions was not appealing and honestly frightening, but off we started. Right off the bat, we got stuck in rush hour traffic in New York City and were delayed still more. We didn’t reach the speed limit at any point until we got to Staten Island. OK, so far, so good. The first flakes of snow started to fall halfway through the state of New Jersey — WAY TOO SOON! We expected the snow and driving conditions to worsen as we drove south into the belly of the beast — and it did. 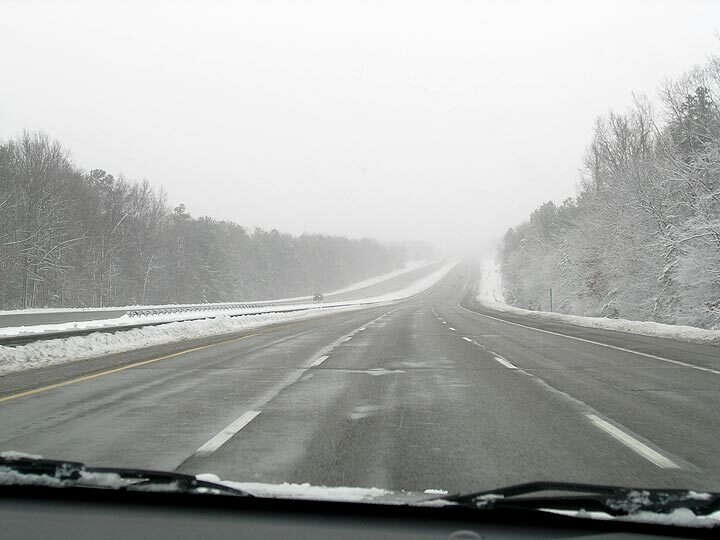 Driving conditions continued to worsen through Maryland. It was SCARRREEE, but I drove carefully at greatly reduced speed. We needed to get past Washington, DC to somewhere in Virginia before we could find a motel. Amazingly as we got to the Washington, DC area, the precipitation turned to rain and stayed rain until we reached our motel about 50 miles south of Washington. We decided to sleep it out and deal with whatever we had to in the morning. After a good night’s sleep, we looked out to find only a few inches of fresh snow. This area had been pounded with two recent storms, so the locals were happy about that. The weather reports indicated that the snow was almost completely north of us. We had made the right decision to push to Virginia. We got on the road and headed to the nearest airport in Richmond, VA. I didn’t even know if there would be any employees there, but luckily there were. After 20 minutes of complex changes to the record, we had our reservations to West Palm Beach from Charlotte, NC at 6 PM. What was the name of that comedy movie where the ticket agent keeps typing and pressing hundreds of keystrokes to accomplish a simple task? That was me, watching this woman, talking on the phone to another agent to accomplish this incredibly complex task of changing our plane reservation. We could have flown from Richmond, VA to Charlotte, NC, but most of the flights were sold out and weather conditions were quite sketchy in Richmond. So we elected to drive to Charlotte and catch the plane there. We’ll be arriving in Charlotte shortly. The weather is sunny and very windy, so I’m hoping that our flight will get to West Palm Beach today. Got my fingers crossed. So now that you see the lengths we were willing to go to to exhibit at this show, you HAVE TO come and visit. :>) I’ve brought an incredible number of new and exciting items that I did not have at the Miami shows. See you there! The show must go on! On February 3, 2010, Sotheby’s London held their Impressionist and Modern Art sale, with impressive results. 31 of the 39 lots sold, grossing a total of $229 million. 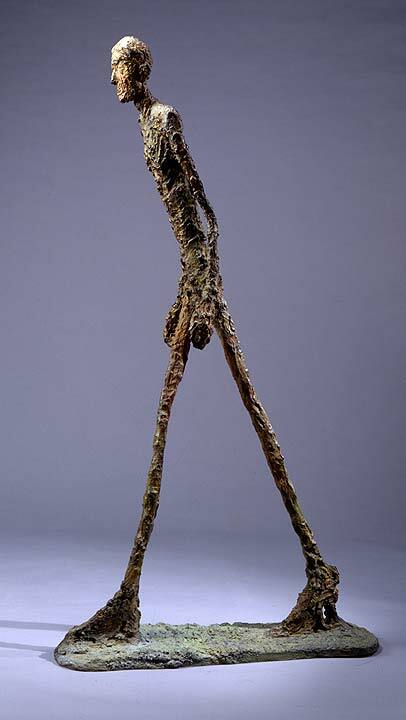 The top lot of the sale, a bronze scupture by Alberto Giacometti entitled “Walking Man I”, set a world record for the most expensive single item of art ever sold at auction, when it sold for $101,426,070, including buyer’s premium. The guesswork is that it was purchased by one of Russia’s new billionaires. It’s interesting to point out that the new world record holder is not a unique item. It was cast in 1961 and numbered two of six. I guess that means there are five other owners with big smiles on their faces, although most of the others are in museum collections. 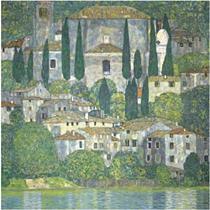 The next best result went to Gustav Klimt, with a painting entitled “Church in Cassone – Landscape with Cypresses”. It sold for $42 million, including buyer’s premium, more than double the pre-sale estimate of $19-28 million. 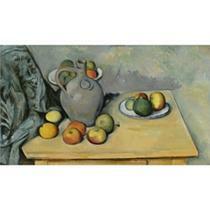 Third best was a still life by Paul Cézanne, which sold for $18,413,075, including buyer’s premium, within the pre-sale estimate of $15.5-23 million. I think I’m in the wrong business. 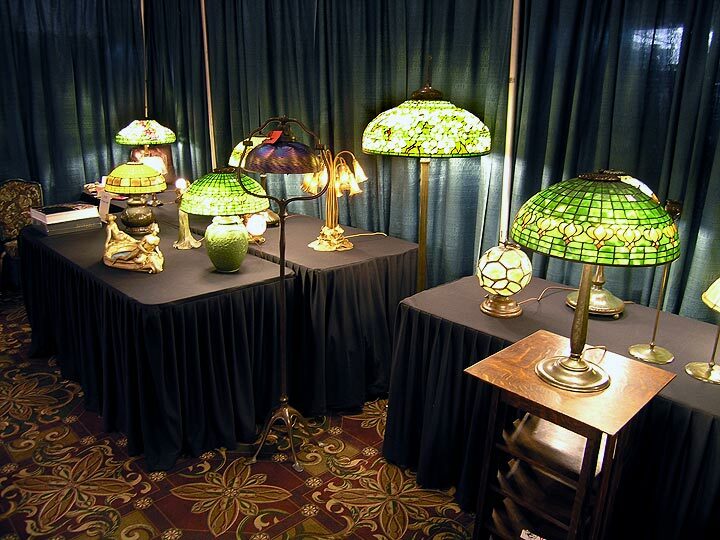 No Tiffany lamp has ever sold for more than a couple of million dollars at auction. 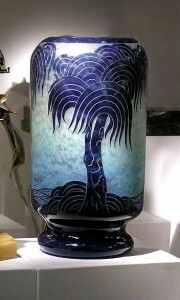 No Gallé vase has ever sold for more than a couple of hundred thousand dollars. Just one or two billionaires is all I need. Every category of item that I sell has its ups and downs. 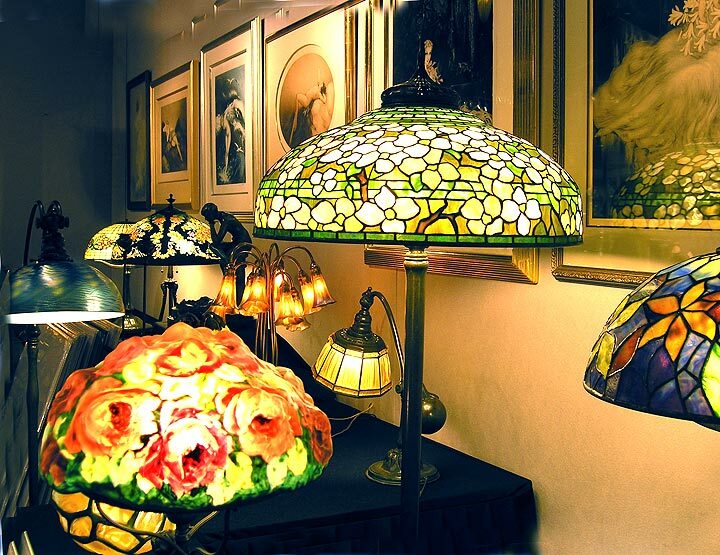 I’ve seen it again and again with Handel lamps, Louis Icart etchings, art glass shades, etc., etc. It doesn’t take a lot to move the prices in one direction or another. Right now the market in Le Verre Francais glass and Schneider glass is quiet. 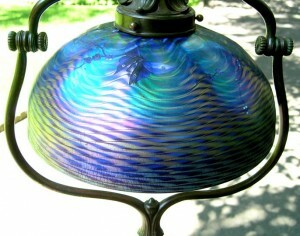 Historically there wasn’t much demand for quality Art Deco glass until 10 or 15 years ago. Then with the publications of a few books on the topic, some French Art Deco glass took off. Specifically I’m referring to the glass of Charles Schneider, that was sold under the name “Schneider” or “Le Verre Francais”. At one point, I couldn’t buy the glass fast enough. Now the market is taking a breather. In other words, many collectors have amassed their collections and are not adding to them significantly unless something special comes along. 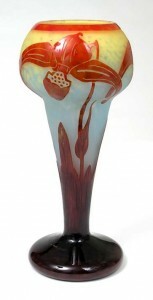 Today, that something special vase came up for auction. Jeffrey S. Evans & Associates, Inc. of Mount Crawford, VA, sold lot #754, a Le Verre Francais Poissons vase, 8¾” tall. The pre-sale estimate was $1-2,000. Apparently they didn’t know what they had, as the vase sold for $9,945, including buyer’s premium, with two determined phone bidders pushing the price. 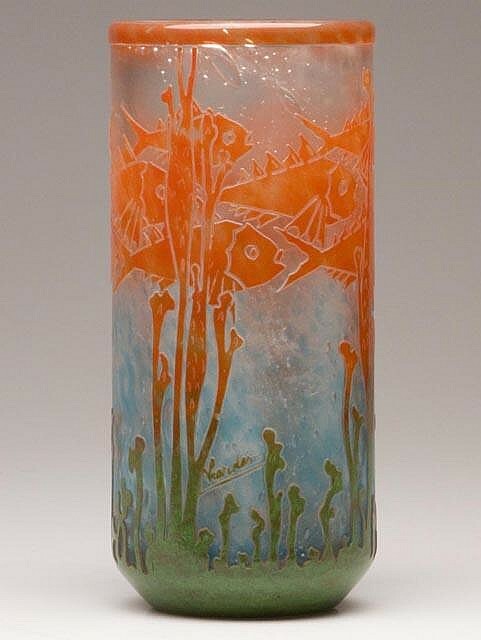 Le Verre Francais vases with fish are considered to be amongst the best and rarest. This was a beautiful example with very good color. The most desirable Le Verre Francais vases have animals, trees or geometric decorations. If they’re big or have unusual shapes, they’re even more valuable. Le Verre Francais vases with floral decoration are more common, but not lower in quality. The quality of Le Verre Francais glass hasn’t changed, only the demand. Just a few new or old collectors opening their wallets will cause the prices to jump again. If you’ve ever thought of adding Le Verre Francais glass to your collection, it’s my strong recommendation that you look now. This is an especially good time, with an excellent supply of gorgeous vases and lower prices. Don’t look back on this time period and regret not having taken advantage.